Keep up with safety training requirements with this comprehensive kit. Include Safety and Health's direct, easy-to-understand messages in your prevention programs. Add sparkle to your newsletters and training materials. Hand them out as discussion starters at regular safety meetings. Keep this kit handy to respond quickly to accident reports and special training needs as they arise. 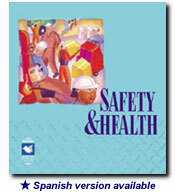 Keep up with safety training requirements with this comprehensive binder. Also available in Spanish and Bilingual versions! On or off the job, keep safety in mind. But they were just horsing around. Confined space entries are never routine..
Do you know where the fire extinguisher is? Call for help before you try to put it out. Pay attention to chemical warning labels. Do push it. Don't pull it. Before you work on it, lock it out! Clean up before you slip up. Do your part to prevent slips and falls. Falls hurt. Watch where you're walking. Basic rule of thumb: leave guards in place. Ouch! Watch out for pinch points. You can't follow safety rules in your sleep. Safety andamp; alcohol don't mix. Safety belts keep the family together.